"Advancing human progress for 50 years - Trask Industries." 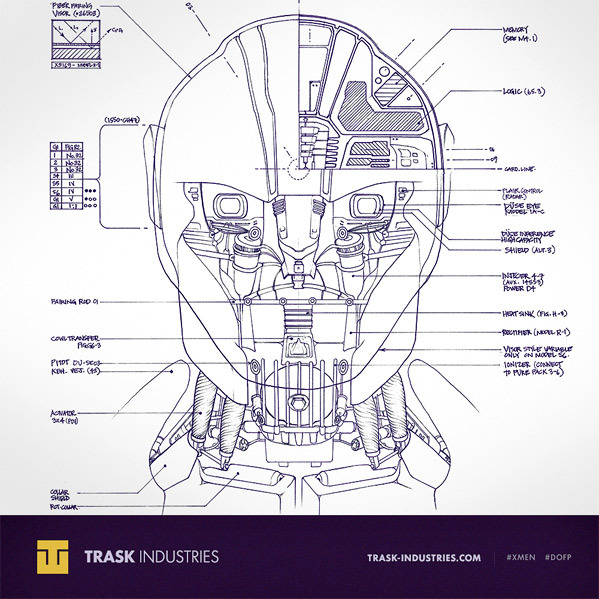 The Trask viral for Bryan Singer's X-Men: Days of Future Past continues with another reveal via Twitter showing a blueprint of the Sentinel head that we saw on display at Comic-Con earlier this summer. The Sentinels have been front and center in the online viral campaign recently, appearing in vintage photos and video on the Trask website where they claim the Sentinels promise "an even brighter future for the human race. It's cool to see detailed imagery coming out so early, I'm just hoping this is leading to some kind of bigger viral event or ARG eventually. View below. X-Men: Days of Future Past is directed by Bryan Singer and written by Matthew Vaughn and Simon Kinberg. The sequel features cast members from the original X-Men franchise like Hugh Jackman, Patrick Stewart, Ian McKellen, Halle Berry, Anna Paquin, Ellen Page, Shawn Ashmore and Daniel Cudmore along with X-Men: First Class cast members like James McAvoy, Jennifer Lawrence, Nicholas Hoult, and Michael Fassbender. New cast members include Omar Sy, Peter Dinklage, Fan Bingbing and Boo Boo Stewart. 20th Century Fox has Days of Future Past set for release May 23rd next summer. Follow updates in the X-Men viral on the Trask Industries website or the X-Men Movies Tumblr. There's still a whole year to go. Lame. Singer needs to stop. the great promotion, I guess he means. Yeah, the studios should stop great promotion, its not like the movies should have it, right? Singer needs to stop living that's what. Everything this guy makes looks like a TV movie. are you saying he should die cause his films look like TV???? Stop going haywire buddy with the question marks. I hate singer. If you like him that is fine with me. But I do not. And I was speaking figuratively. i love Bryan Singer ????????????????????????????????????????????????????????????? Now you can see an in-depth look at how terrible these are! Yay! None of these X-men movies makes sense or have good continuity from one film to the next. This Sentinel looks nothing like the one seen in the Danger Room in X3. I guess i'm one of the few that's not a big fan of the X-men franchise so far. Fox should just give the rights back to Marvel. I still wonder what to expect from this, I like most of the x-men movies with the exception being wolverine. I really didn't expect anything from first class but that was a damn good flick, I just don't know guess I'll have to wait and see.